Where should I focus when taking a Landscape Shot? When shooting a typical landscape image it is normal to attempt to keep as much of the image in focus as possible. This means selecting a small Aperture (remember the larger the number the smaller the actual Aperture) to ensure that you end up with a large depth of field. This will ensure that parts of the image that are both close and far away from you have a good chance of being somewhat in focus. But at what point in the shot should you actually focus the image? I suspect that many digital camera owners would set the focal point as the middle of the shot – or even at the horizon – however it might not actually be the ideal place to focus your camera. 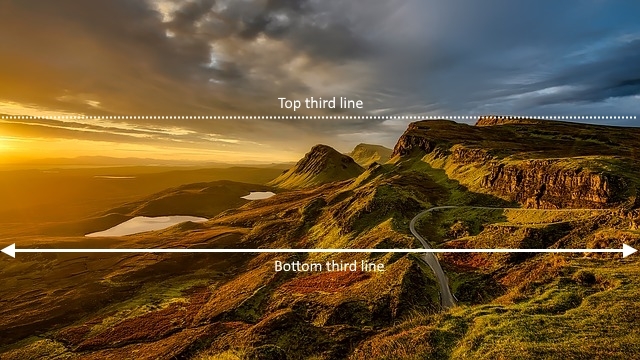 Ok – I’m not sure if ‘thirdway‘ is an actual word – but what he was suggesting is that the point that will help you get the maximum amount of your shot in focus is at a point around a third of the way up an image (as highlighted above).